Despite the fact that they were born several years apart, it would be easy to believe that Joel and Ethan Coen were joined at the hip. They do all of their interviews together, been involved in almost every film they’ve ever done together, and even share a Wikipedia page. You can never be sure what genre of film you’ll get out of the Coens – they’ve done everything from neo-noir to westerns to gangster films to screwball comedies. What you can expect are certain tropes and recurring elements: deliberately unresolved storylines, repeated lines/catchphrases, and quirky characters who seem to communicate on a different wavelength than everyone else. You also get a strong sense of place – often right down the music. The Coens also have a reliable stable of actors, with names including John Goodman, Steve Buscemi, Frances McDormand (Joel’s wife), and John Turturro. They also have a way of attracting plenty of other A-list actors to their films. While the two have almost always collaborated on both producing and directing, they were required to only use one name as a director under guild rules. They also edit most of their own films, under the alias Roderick Jaynes. The Coens have actually been nominated for Academy Awards under this alias, putting him (well, them) on a short (actual) list of fictitious Oscar nominees. Though they’ve only won a handful of awards (not like it matters), their reputation as filmmakers precedes them in Hollywood. Bill Murray, for example, discussed in his recent reddit AMA that he only did Garfield because he mistakenly though the Coens were involved. They’ve also been involved in other films outside of directing, including Bad Santa and Crimewave. For many years, the Coens could not share a director credit because Directors Guild rules mostly forbade joint director credits. As such, for many years Joel was credited as the sole director and Ethan as the sole producer, despite the fact that they equally shared both duties. It wasn’t until 2004 when they were allowed joint credit. Despite critical acclaim and a strong fanbase, the Coens’ esoteric filmmaking can be divisive at times. No Country for Old Men is a prime example – it won massive critical acclaim and cleaned up at various award ceremonies, but state your opinion about it amongst a group of casual moviegoers and be prepared for a fight. Below are four of the less controversial films/more accessible films of theirs to start your journey. 1987 Minnesota. Jerry Lundegaard (William H. Macy), salesman at his father-in-law’s car dealership is in big financial trouble. Jerry meets with criminals Carl Showalter (Steve Buscemi, in one of his Buscemiest roles ever) and Gaear Grismund (Peter Stormare) to help him. The plan: kidnap Jerry’s wife and hold her ransom – when his father-in-law pays, Carl and Gaear get to keep half the ransom. From the start of the kidnapping, Carl and Gaear (Carl in particular) screw up the operation and things get violent – much to Jerry’s dismay. The violence attracts the attention of the very pregnant local police chief, Marge Gunderson (Frances McDormand), who does her darndest to solve the murders, yah. It’s legally impossible to discuss this film without mentioning that it barely takes place in Fargo, but the Coens figured it was a better title than Brainerd, where most of the action takes place. Hard to disagree. Be prepared to hear the word “yah” a lot. Bonus points for the Bruce Campbell cameo. A strong adaptation, a folk-filled soundtrack, and a sepia-toned sense of place come together in harmony for O Brother. The film is an adaptation of Homer’s Odyssey, following the same general storyline and featuring many characters who correlate with the source material. It’s a film that will give you a little bit of everything, but you’ll leave with a smile. 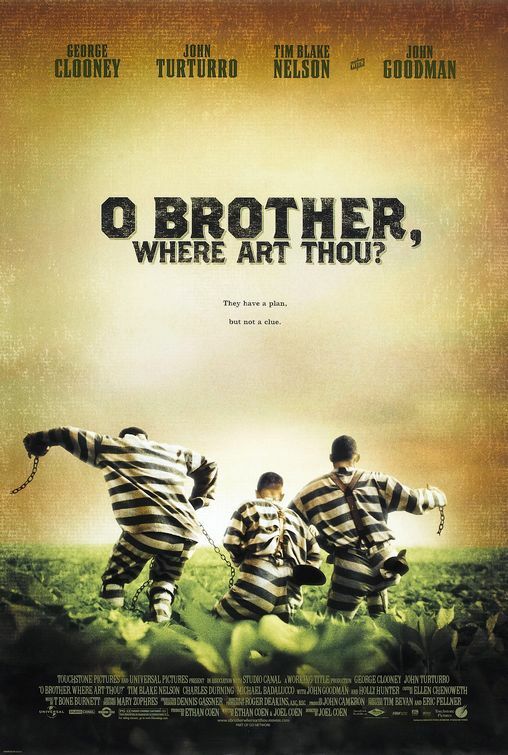 Set in 1937 Mississippi, the film centers on three newly-escaped convicts – Ulysses Everett McGill (George Clooney), Pete Hogwallop (John Turturro), and Delmar O’Donnell (Tim Blake Nelson). Everett orchestrates the group’s escape from the chain gang to find a load of cash he stole from an armored and buried before his conviction – and since the area where it’s buried is set to be flooded to create a reservoir, time is of the essence. During their escape, they encounter a blind man who tells them that they will find treasure but not the one they seek. The three men go on a journey that sees them become unlikely folk music stars, infiltrate a KKK rally, get robbed by a one eyed Bible salesman (John Goodman), and accidentally intervene in the gubernatorial race – all while being chased by the sheriff. The Coens are the only directors I have ever seen get George Clooney to play anyone other than Danny Ocean (Astronaut Danny Ocean, Hawaiian Danny Ocean, Lawyer Danny Ocean), and this film is no exception. This alone should get your attention. Separate from the film, the soundtrack was a massive success, winning a Grammy and spawning a documentary/concert film about the musicians involved. This is actually one of the deeper cuts in the Coens’ catalogue, but also one of their most accessible films, so it gets a mention here. The Man Who Wasn’t There is the Coens’ most obvious neo-noir (a genre described in a previous installment), perhaps even more so than their debut, Blood Simple. The entire film is black and white, the main character is stuck in a morally and legally gray area, and the entire story is told with voice over narration. 1949, California Bay Area. Ed Crane (Billy Bob Thornton) is a quiet chain-smoking barber. He is married to Doris (McDormand), a lush who may be having an affair with her boss – “Big Dave” Brewster (James Gandolfini), head of the local department store who never turns down the chance to brag about his war heroics. One day a customer named Creighton Tolliver (Jon Polito) comes into the barber shop and tells Ed that he’s looking for investors in a new technique called dry cleaning. Ed decides that he’s interested, in part to break from his monotonous life, and decides to get the money by anonymously blackmailing Big Dave. This sets off a chain of events that lead to murder, which Ed committed but for which Doris gets framed, and Ed wants to get her out of it. Characters introduced over the course of the story include talented-yet-pricey defense attorney Freddy Riedenschneider (Tony Shaloub) and talented young pianist (at least in Ed’s eyes) Birdy (Scarlett Johansson). As noted in an earlier installment of this series, The Big Lebowski is influenced by The Big Sleep in many ways. Sure, there’s the war veteran in a wheelchair and the general story, but it’s more than that – it’s a story told in an episodic fashion that’s more about the characters than it is about the plot. I’d describe the plot to The Big Lebowski, but that’s impossible – apologies for being a human paraquat to anyone who was expecting me to do so. You’re just going to have to trust me here when I say this is worth watching. It’s quintessential Coen. 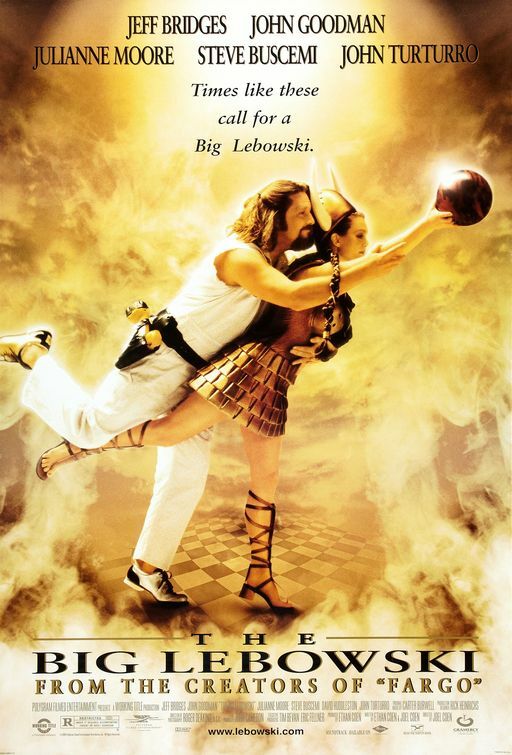 At its core, The Big Lebowski is about its characters, so I’ll describe them instead: loveable stoner slacker Jeff “The Dude” Lebowski (Jeff Bridges), sociopathic Vietnam vet Walter (John Goodman, in one of his best roles), good natured dweeb Donny (Steve Buscemi), wheelchair-bound curmodgy millionaire Jeff “The Big” Lebowski (David Huddlestron), trophy-wife-with-a-backstory Bunny Lebwoski (Tara Reid), pederast bowling god Jesus Quintana (John Turturro), feminist avant-garde artist Maude Lebowski (Julianne Moore), awkwardly willing-to-please butler Brandt (Phillip Seymour Hoffman), a group of nihilists (including Flea) and narrating cowboy The Stranger (Sam Elliott’s Mustache). Just a little bit of the story to put it in context: The Dude comes home to find thugs threatening him, mistaking him for the Big Lebowski, who then micturate on his rug. Seeking compensation, The Dude visits the Big Lebowski and gets embroiled in a giant caper. Throw in plenty of bowling. Watch this movie twice. You may not get it the first time, but after the second viewing you will wonder how you lived without it. You will be quoting it for the rest of your natural life, man. All of the listed films are available on Netflix.